Tickets are available at The Farmacy, from Calliope members, and at the door. General Admission, sliding scale $15-30, limited income $2-10. Calliope is a 501(c)3 organization. Amounts over $15/ea may be considered a charitable donation. ​Overflow parking at Athens Middle School. 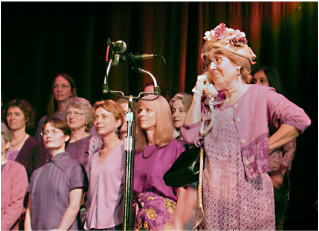 Accessible parking on request from ticket seller or by email: calliopefeministchoir@gmail.com by day prior to show. Overflow parking at Athens Middle School. Accessible parking on request from ticket seller or by email: calliopefeministchoir@gmail.com by day prior to show. with a full concert in May. We offer a full sliding scale for dues and free childcare. Calliope values inclusivity and diversity. We strive for beauty in vocal production and musical expression. We have two open rehearsals each September at the start of our season to welcome new singers. All women singers, including high school and college women, are welcome. See Sing with Us and About Us for more information! And please visit our Sponsors page to support our sponsors. Make it better, sing together! or call 740 hyphen 662-2022 for more information. Visit our sponsor page for links!